Roger Page won the Coca-Cola Spartanburg County Super-Senior championship at the Carolina Country Club. Roger Page has been playing senior golf for many years while Doug Ramey is relatively new to the senior circuit. The two golfers finished up on the top of the leader board at the Coca-Cola Spartanburg County Senior championship played at the Carolina Country Club. Page was the only golfer with all red numbers on the scoreboard. The Super-Senior champion shot rounds of 70 and 69 for a 5-under par 139 total and the championship. “I’ve been playing in the county championship for 35 years and it is nice to finally get a win,” said Page. “Even though we played a shorter course than the seniors, having red numbers on the board looks pretty good to me,” he said. Page had been close to a victory a few times in a county tournament. He looked to be in control when he eagled the par-5 4th hole after he ran in a 25 foot putt, but he he gave those two shots back with a double bogey on number 14. The Willow Creek golfer went on to claim a convincing win over defending champion Mike Ridgeway and Robin Goings. “I just retired a couple of weeks ago and now I don’t have to worry about emails and phone calls so I can just concentrate on my golf like I did this week,” concluded the Super-Senior champion. 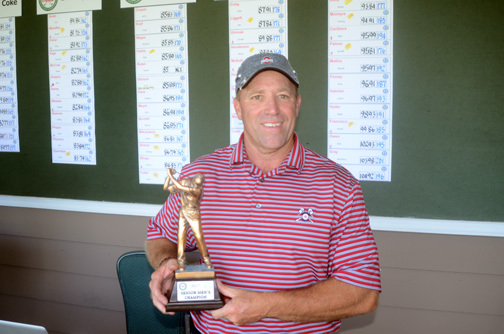 Doug Ramey shot a final round 2-under par 70 to win the Coca-Cola Spartanburg County Senior Championship. 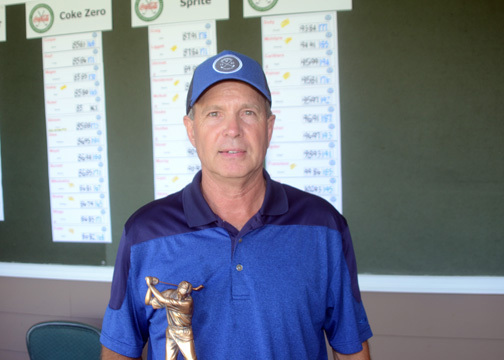 Ramey earned his second Spartanburg County senior title. He won his first championship at Three Pines Country Club two years ago. The former champion is one of the younger seniors in the tournament. The Spartanburg County senior allows golfers who are 50 or older to play in the championship while the SCGA, CGA and USGA require golfers to be 55 for senior status. Ramey started the final round two shots behind first round co-leaders Todd Webber and Bill Gee. The two first round leaders struggled while Ramey was playing a comfortable round. “There really wasn’t anything spectacular about the way I played,” he said. “I hit a lot of fairways and greens and made a few putts,” said Ramey. Ramey played in the final group and was able to see how Webber and Gee were playing, but he didn’t have any idea how former champions Stan Sill was doing. Ramey considered Sill one of the players he needed to beat to win a second title. Sill started the final round one-shot behind Ramey. He shot even par to finish tied with Gee for second place. The two golfers finished at 147, three shots behind the winner. “I thought I would need to shoot around 69 to be in good position to win. I missed a chance for an eagle on the final hole or I would have hit my number,” said Ramey. Sill finished tied for second with Gee. Robin Goings finished in fourth with Frank Wilson in fifth place. The two-time champion believes that winning the first championship is much harder than winning a second title. “You work really hard to get that first win, but you want to back it up with a second win to prove it wasn’t a fluke. I’m really glad to get the second win,” concluded Ramey. Flight winners included: First Flight – Stan Sill, Second Flight – Mike Ridgeway, Third Flight – Randy Mahaffey, Fourth Flight – Mickey Shaine, Fifth Flight – Tim Cash, Sixth Flight – Gerald Palmer. The tournament is organized by The First Tee of the Upstate. The organization benefits from proceeds raised by the Spartanburg Senior, Women’s, Junior and Amateur. The tournaments raise around $10,000 annually to help the First Tee with their mission to introduce golf and its values to youngsters.